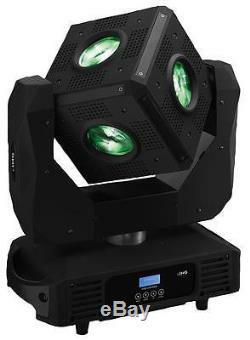 Img Stage Line - CUBE-630/RGBW - Moving Head Light, Retro. 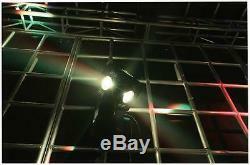 6x30W LED beam cube style moving head with continuous tilt motion. 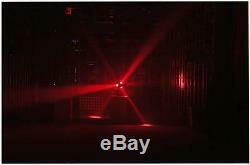 Light source: 6x 30W super-bright RGBW LEDs. DMX channels: 13 or 35 selectable. 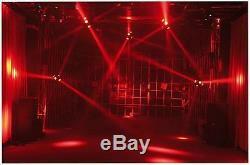 Operating modes: DMX, music-controlled, automatic and master/slave. Rotation angle: 630° Pan, 360°continuous Tilt. Strobe effects with variable speed (1-25 flashes/second). 4 Button menu system with LCD screen. Images shown are for demonstration purposes. Product will match description but may vary from images shown. All our listings include VAT at the current rate. We dispatch orders Monday to Friday. We aim to dispatch all other orders that have been paid & confirmed before 16:00 on the same day. If you are not happy with the charge the sale can be cancelled. For full details please check our Terms and Conditions. We pride ourselves on making sure each and every customer is satisfied before, during and after a sale is completed. Please put your own return address on the back of the package in case there is any problem delivering to us. 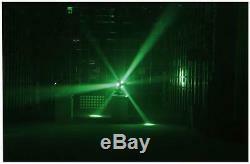 The item "Img Stage Line CUBE-630/RGBW Moving Head Light, Retro" is in sale since Wednesday, September 7, 2016. This item is in the category "Sound & Vision\Performance & DJ Equipment\Stage Lighting & Effects\Stage Lighting Single Units". The seller is "pcarena-bristol" and is located in Farnborough. This item can be shipped worldwide.